The Albin Ballad engine lives in an enclosed fibreglass box under the cockpit floor. The lid is a two part affair that seals against the engine bay pan. 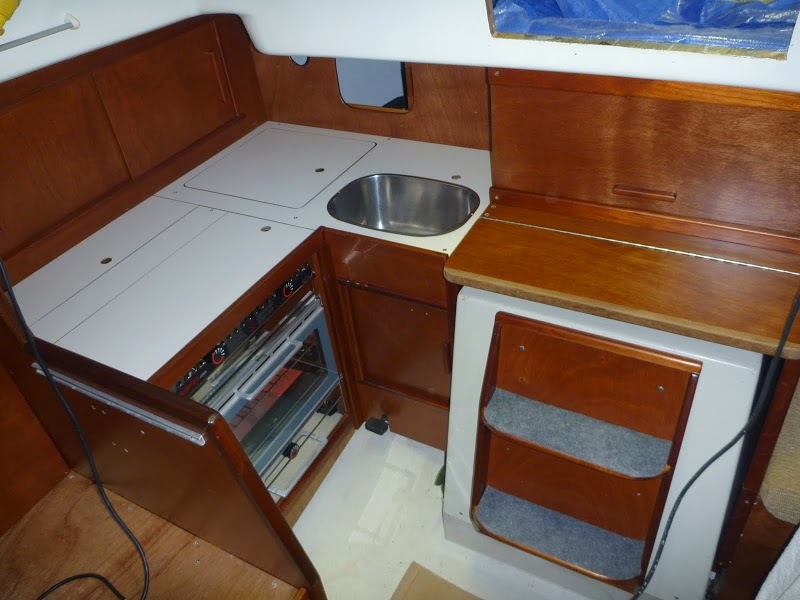 The forward section holds the companionway stairs, with a small storage box on top. Both sections are tied down, and together, with rubber hood latches. Both pieces slide forward off the engine pan into the main cabin. For checking fluids and doing oil changes only the forward part needs to be removed. With the removable cockpit side panels installed during the restoration, there's 360° access to the engine and gearbox, albeit somewhat cramped. My latest project has been to reduce some of the noise coming through the engine box housing the Yanmar 2GMF 20 Diesel. I've used 1" (25mm) sheets of Foam Sandwiched Mass Loaded Vinyl Barrier with a vapor barrier on one side. I used these directions as an installation guide. Cardboard templates were made for each piece, allowing for the actual thickness of the material. To affix the sheets to the inside of the engine box a spray-on adhesive combined with pins epoxy'd to the inside of the fibreglass box were used. 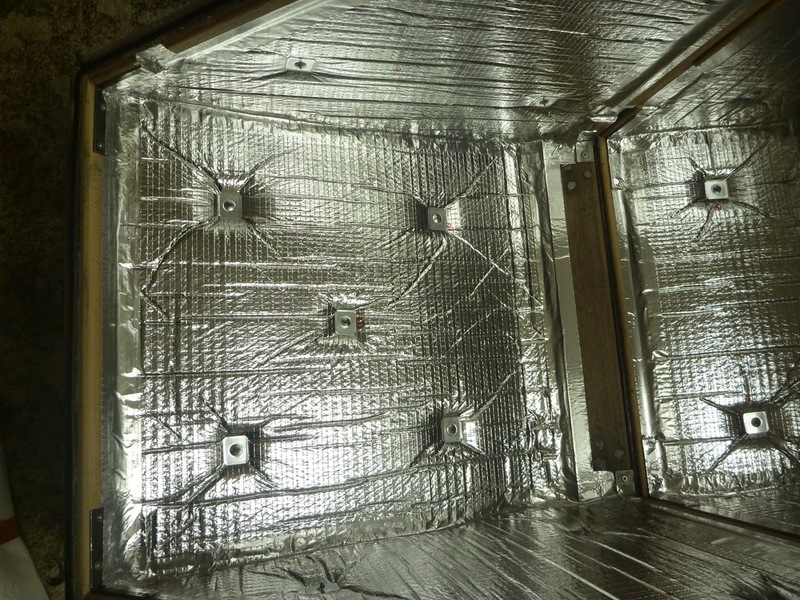 All insulation seams and edges were taped with HVAC aluminum tape. 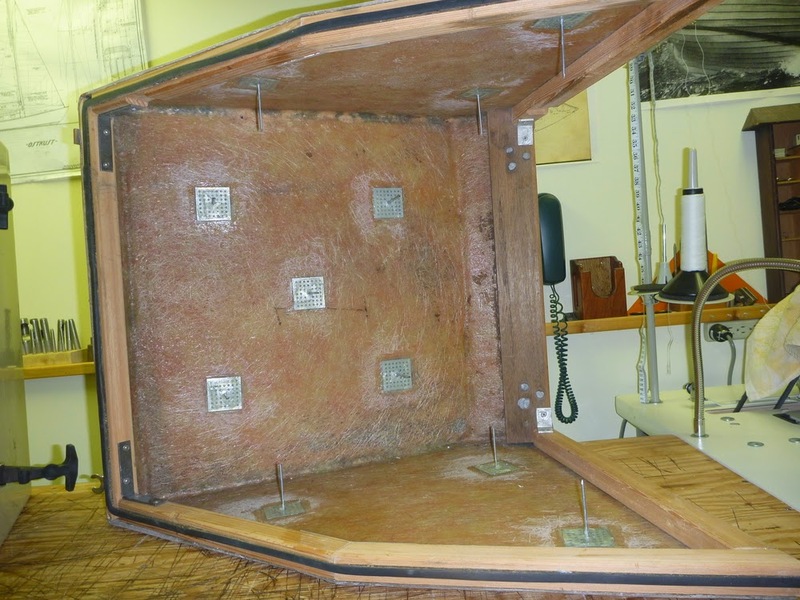 This sound deadening material adds a bit of extra weight to the two-piece box, but this only proved an inconvenience when transporting it to the boat and lifting the pieces through the companionway opening. The Yanmar has a fuel filter bolt protruding on the starboard side, so a notch in the wood frame on the forward box was needed to allow fit. Other than that, once inside the cabin, they're relatively easy to slide into place. Being concerned about possible heat build-up in the engine room, I've installed a remote heat sensor on the inside of the box. AN ANCHOR MOUNT FOR THE BALLAD. The Ballad has a small anchor cradle to the starboard side of the fore stay attachment, an integral part of that fitting. Trying to fit my 10kg Bruce there was not an option. Looking at the Windline BRM-4, especially made for the 10kg Bruce, I found it was about 1/2" too wide to squeeze on the port side, between the fore stay fitting and the stanchion upright. So ... back to the drawing board. My spare anchor is a 7kg Bruce "clone" and looked like it might fit the bill. Starboard view of smaller "Bruce"
I drilled a hole through the forward part of the shank to align with the holes in the Ballad anchor mount and used a 1/4" bolt to hold it fast. This will soon be replaced by a spring-loaded pin to make it a one-handed job to undo. The original bronze anchor roller was replaced with a larger Delrin one, with deeper and narrower groove to hold the shank better. This setup held the head of the anchor well enough, but the tail end was free to flop around. An order to Marine Parts Depot for an anchor lock solved the problem. Anchor Lock, raised up on 3/4" block, and bolted through the deck. Aft view of anchor lock. It's a compromise, as it's a bit small for a 30' boat, but will be OK for 90% of my anchoring needs. If I need a bigger hook for an overnight anchorage it's a simple matter to swap it for the 10kg Bruce or the 25lb CQR that I have as spares. BOAT RESCUE PART 20: FINALLY ... LAUNCH DAY ARRIVES. Our dodger materials arrived a week early so the few days of relaxation I'd planned to have before the launch instead turned into a sewing frenzy in our basement sewing room. Lowering the mast onto the boat. Hitched up and ready to go. Trying to jack out bent pushpit. Bending new section for repair. It's good for the soul to have a change of pace occasionally. As a reprieve from sanding and priming and sanding on the decks and cockpit I checked my list looking for a nice small project to tackle: the tiller looked interesting. The Ballad tiller is a simple shape: a curve near the yoke and a gentle sweep to the forward end. The previous tiller had been smashed when the mast was lowered. I'd glued it back together to get the shape, and also used it to cut plugs from for patching holes in the interior Mahogany joinery. Rather than cut from one solid piece of wood like the one I was replacing, laminated construction seemed the best option. Instead of using thin strips that would bend easily I decided to try using 1/2" strips and steam bend them before laying them up. This would relieve most of the stress in the wood fibers. 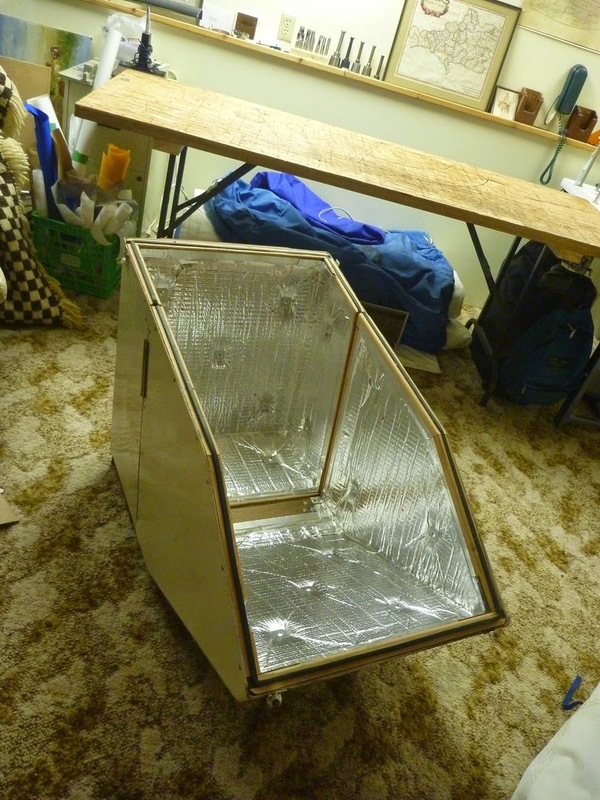 A simple steam box about 5' long was made from some 2x6 material, leaving an inside box about 4" square and 5' long, with 1/2" ply end caps. A 6" x 4" slot was cut in the center of the bottom and a piece of 1/2" plywood, large enough to cover the boiling water pot with a matching hole, was attached. The whole rig sat on a Coleman propane camp stove set on the garage floor. BOAT RESCUE PART 17: More progress pictures. Top hoses are two vents, bottom hoses are waste in and out lines. BOAT RESCUE, PART 16: Lots of pictures! It's been a busy time for us this year, and I've neglected my restoration updates, so I'm going to post lots of pictures with as little chatter as possible. Junction block in head, for mast wiring and interior lights. Electrical panel, still a work in progress! Gantz 30 Watt Solar panel trial fit. Boat Rescue part 15: Playing with LED Strip Lighting. Today I opened the goody drawer and pulled out some things I bought a while ago to light the cabin. My idea is to have the cabins lit with indirect lighting along both sides. The valences covering the hull-deck joint seemed a logical place. The idea is to illuminate the boat enough to find ones way around without draining the battery. To do this I picked up some strip LED's on ebay. Strip LED's with a solder terminal every three diodes. Valence, upside down, on the bench. BOAT RESCUE, PART 14: UPHOLSTERY TIME. With the cooler weather here again it was time to line up an indoor job for a few days. I've had my roll of upholstery fabric for a while, sitting in the basement waiting for some attention. The first pieces made were the six settee cushions, using super soft foam for filler and covered with an acrylic fiber fill for a bit of extra padding. The fiber fill also makes stuffing the foam into the cover easier. Because the fabric has a lot of longitudinal fibers, my first attempt cutting it with scissors resulted in a lot of frayed ends coming loose, making it hard to sew. I was concerned the fraying would spread over time and weaken the seams. Using a hot knife solved the problem nicely. BOAT RESCUE: PART 13, A BIT OF EVERYTHING. Previous Post: BOAT RESCUE PART 12: HULL PAINT. The last several weeks have been spent on many smaller tasks, with some left partially finished until old parts were rebuilt or new parts ordered. 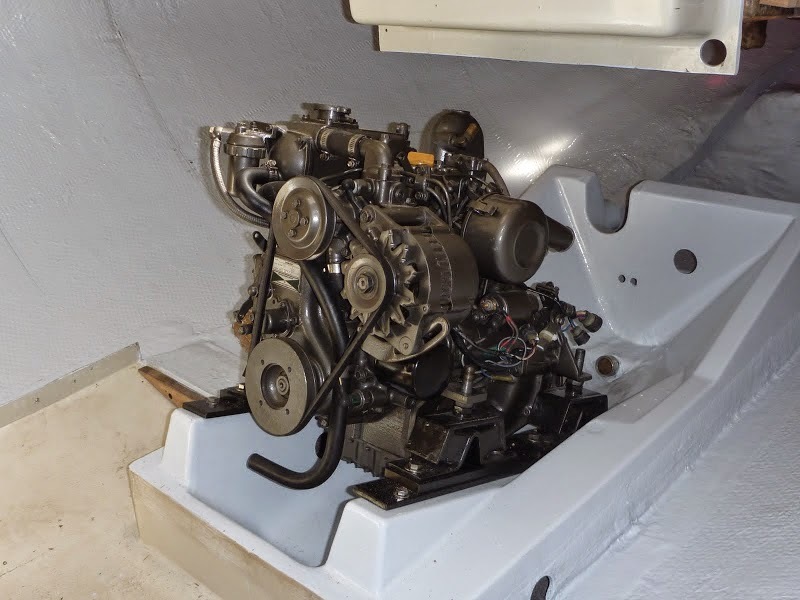 One of the important things was to get the engine completely connected to shaft, fuel, water, and exhaust, and give it a test run to check for operation and leaks. This went well, even though I discovered that Vetus water strainers love a slight vacuum, but won't tolerate any pressure without leaking water all over the locker. This turned out to be a good test of water being able to find it's way to the bilge without flooding any lockers! Bennath has a total of seven winches: four in the cockpit, two on the mast, and one on the coach roof. Every winch needed disassembly and cleaning, before reassembly with fresh grease, and new pawl springs. The sheet winches needed the drums re-plated, but the rest were still in acceptable condition. BOAT RESCUE PART 12: HULL PAINT. Previous Post: BOAT RESCUE PART 11: INTERIOR FINISH WORK. The weather has been perfect and I had all my paint materials in hand, so there was no excuse not to get busy on the hull painting. Using water-borne paint for the first time was a good reason to invest in a new spray gun. This unit comes with three different sized nozzles, allowing a wider range of paint types. BOAT RESCUE PART 11: INTERIOR FINISH WORK. Previous Post: One Year in Restoration: the Boat Rescue. It's been a busy summer ... is it almost over already? Between trips in Sin Tacha to the Albin Vega Rendezvous (which turned into an eleven day jaunt) and two weeks in Oklahoma with the "kids", there has been less work done on the Ballad than usual. Because I used slightly thicker plywood for the bulkheads, the chain plates support (lying beween the two bulkheads) would no longer fit. It was cut, shortened, and re-welded to fit tightly between the new plywood. This had to be done on both sides. One Year in Restoration, the Boat Rescue. Previous Post: Part 10: Interior Work Starts in Ernest. Just a note in passing, today marks exactly one year since we pulled the Ballad home. At times things seem to be going pretty slow, but looking back at the early pictures I realize just how far we've come. Previous Post: BOAT RESCUE PART 9: THE FUN CONTINUES. It seems as though progress has been slow, but checking my photo files I realize this is not the case. Several non-boat related projects have been completed, freeing me up to concentrate on the Ballad again. The damage around the table supports in the cockpit floor greeted me every time I climbed into the boat, so it was time to attend to that job. Leaking damaged area around table leg sleeve. I cut out the damaged areas around both sockets and filled them with epoxy-soaked plugs, adding a layer of epoxy to fill them back to original floor level. A reinforcing piece was added below to strengthen the repair, and allow leg sockets to be added, if needed, in the future. Epoxy/plywood reinforcement patch, curing with a little help from a heat lamp. BOAT RESCUE PART 8: FIRE IN THE HOLD .... well, in the garage anyway. The Yanmar 2GM20F is now officially alive. The next step is to build a gantry over the boat to hoist it in. More later! Next: Boat Rescue Part 9: The Fun Continues. BOAT RESCUE PART 7: GETTING IT ALL UNDER COVER. 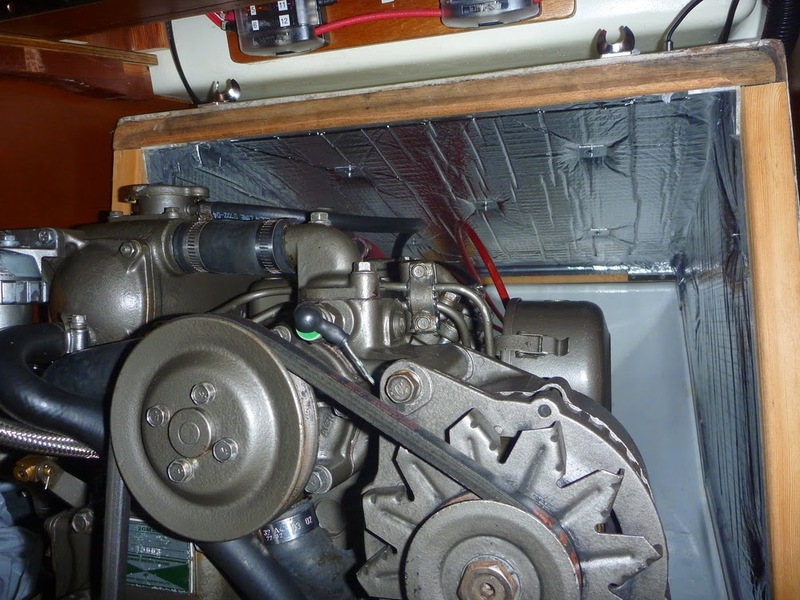 PREVIOUS: BOAT RESCUE PART 6: INTERIOR REBUILD CONTINUES, ENGINE EXAMINED.. The original shed was too low to get the Ballad under, so I raised the side walls from pallet height to about 72". This put a wider part of the shed at boat deck level, and gave more headroom when working on the decks. It was long overdue, as the original pallet base and walls, sitting on the ground, were rapidly turning into compost! New boat shed walls under old arches. Next on the program was to get trailer and boat together. This required hiring a local crane to do the job. Having 4-wheel drive and 4-wheel steering certainly helped it negotiate the driveway. Climbing the steep grade ... backwards! BOAT RESCUE PART 6: INTERIOR REBUILD CONTINUES, ENGINE EXAMINED.. PREVIOUS: BOAT RESCUE PART 5: INTERIOR REBUILD STARTS. (Please click on any picture for enlargement). The interior woodwork has all been fitted, ready for removal, sanding, staining, and varnish varnish varnish! Galley and Steps on Engine Cover. (Previous: BOAT RESCUE PART 3: SO, WHAT DID I DRAG HOME? It's a relief to stop taking things off the boat and start some serious rebuilding work. One of the first jobs, after removing all the debris from the old ceilings, was to "de-glue" the hull sides. In places the old adhesive peeled off in sheets, partly due to the moist conditions in the boat. But most of it put up a good fight, and it took an assorted arsenal of tools to persuade it to let go. My main tools were a razor blade scraper, a wire brush, an old 1/2" chisel, gloves, and a kneeling pad. I found that if I kept the razor blade wet when scraping the glue did not re-stick to the fiberglass. Another useful tool was an abrasive pad, also kept wet. Even after it was all removed (two days work) little bits of rubbery glue were everywhere, trying their best to re-adhere to anything they came in contact with! Working inside the bare hull was interesting: everything dropped immediately headed for the bilge, and unless I kept a grip on something I was apt to slide bilgeward also! Most of the gear I removed was in decent shape. The winches, although dirty with debris, are in good working condition and should be fine after a good cleaning and lubrication.